John DiPietro for NHVoice: Lately, Boston Dynamics has released a new video of its robot called Mini Spot. 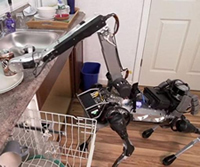 In the video, the robot is seen running around outside, planning around objects in a home and climbing up stairs. The best part of the video is how delicately the robot picks up a wine glass and puts into the dishwasher. The wine-glass act has been highlight as it could be judged as to how much skilled is the robot in handling delicate things. For robots to safely operate around humans they need to be able to sense their environment and capable of knowing how mighty they are.